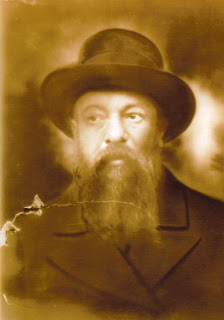 Rabbi Menachem Nochum Twersky, born in 1869, was the son of R' Mordechai Twersky, the only child of R' Dovid to survie childhood. His mother was Yocheved the daughter of Rabbi Shimon Shlomo of Savaran. His father died when he was eight years old. As the only living desendant of R' Dovid he became the rabbi of Tolna upon his grandfather's death. He was married to his 1st cousin Sima the daughter of R' Moshe Tzvi, son of R' Shimon Shlomo of Savaran. At left is the grave of Sima Twersky, buried in Chelsea, Massachusetts. R' Menachem Nochum and Sima had ten children. 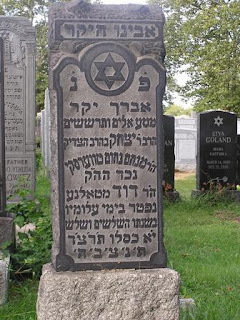 His oldest child was R' Dovid Mordechai, then R' Moshe Tzvi, R' Meshulem Zusia, R' Yochonon, R' Yitzchok, R' Avrohom, R' Ahron, Chanah Gabai, Feiga Schneider and Chaya Dovreish. I have a signed letter by Rabbi Twersky. Yitzchok, the one whose kever is pictured above was my grandfather.